Magic Lessons Reveal Secrets of Real Magic in the comfort of your 0wn home! Baffle and Blow The Minds of All Your Friends!" APPLAUSE YOU'LL GET.... EVERY TIME!" I will show You how in Easy-to-Follow Magic Lessons - GUARANTEED! "No other magic course explains everything so clearly!" Enjoy in the Comfort of Your Home! You won't need expensive tricks or magic props, fancy gimmicks or difficult knuckle-crunching sleights or weird moves. Leave all that to the amateur club magician, who really only wants to amuse himself and try to outdo his fellow magicians. You'll be able to amaze, amuse and entertain your friends or indeed any audience and receive the enthusiastic applause you deserve! Everbody Thinks I've Been Practicing Magic for Years! What a terrific magic course! I was a bit worried that it might be full of hard moves and sleight of hand that I wouldn't be able to do but it's just the opposite. Everything's really easy to follow with your videos. I've just received lesson 8 and the stuff about using a toppit vanisher is completely new to me and really fascinating. It's so simple. I've been having a lot of fun with the Card Thru' Hanky and also the Burnt and Restored Hanky. Everybody thinks I've been secretly practicing magic for years, so I don't tell them I've just been doing it for a few months. By the way, the Cd carrying case that came with lesson 6 was a nice surprise, thanks. I'm looking forward to the rest of the lessons. Oh, your rope routine is a real stunner and I can't believe the thumb-tip stuff. It's all been great. Re. : How To Make Your Life Magical in Easy Steps! magine you could boost your confidence and your popularity by magic! Always be the Life and Soul of any party or gathering! Be able to bring Laughter and Amazement to others! Do you want to gain the Admiration and Respect of your friends? I'm Johnnie Gentle. I'll teach you, in Easy-to-follow Magic Video Lessons! There's no need for the expensive tricks and magic props that are almost everywhere on internet magic sites. Nor will you be burdened with those fancy "knuckle crunching" and finger-flinging difficult sleights or moves. You see real magicians don't just do fancy tricks, they Amaze, Amuse and Entertain those around them, by Doing Magical Things in all situations. Do Magical Things With Ordinary Items! You'll discover how to create magical effects with ordinary everyday items, that tend to be above suspicion and produce the most astonishing and mind-blowing response from your audience. The Video Clips Make Learning Magic Much Easier! So what magical mysteries are revealed in this Unique Magic Course? Amazing and really funny routines with "Sponge Balls"
You'll learn magic tricks that you can do to baffle, amaze and amuse your friends at the bar, in the restaurant, at the table and in the street. How to develop your own Style that can earn you great respect and a nice income. You'll learn to Use Comedy with your magic to "Make 'em Laugh"
The basic sleights and skills that will enable you to do 100's of Magic Effects, using everyday objects, - this makes you a real magician. An Easy and Enjoyable way to EARN THAT LITTLE BIT EXTRA! Most importantly, you'll have GREAT FUN! IN FACT EVERYTHING YOU NEED TO MAKE YOUR LIFE MAGICAL! John, - I had made a living as a Magician before and I wanted to get back into magic and needed new illusions and wanted to work more with adults than the birthday party circuit. I purchased your course as it was the only one I could pay for in installments. I have enjoyed the entire course but I think my favorite is the cups and ball routine as it is a totally different spin on an old favorite. I do a different cut and restored rope routine but will be changing to yours as well as the torn and restored newspaper. I find both of those tricks very effective. I would describe your Magic course as a very valuable resource. I have looked forward to receiving it every month and now that we are finished will miss it. The course has illusions for accomplished Magicians as well as beginners. Now I have enough material I can (and will) put together a show for an Adult crowd. John you have given me very good value for my money and as I have said I will miss getting the monthly lesson. Should you decide to put out a 2nd course please let me know. I would highly recommend "The Magic Touch" to anyone interested in Magic. Thank you John for putting the course together. Over 40 years ago I gradually became involved in the entertainment business as a magician, musician, public speaker, comedy and magical entertainer, and cabaret magician. START OF YOUR MAGICAL JOURNEY! This is a Unique Opportunity to get your hands on a series of real practical Magic that not only shows you the Tricks, Routines and Techniques to build a wonderful reputation as a purveyor of Magic and Fun, but also guides you every step of the way and is great fun to do. SO THAT YOU WON'T BE DISAPPOINTED! ACT NOW! GET ONE MONTH LESSON FREE! DON'T MISS OUT - Book Your Magic Video Lessons NOW! AND GET ONE MONTH FREE! CLAIM YOUR MEMBERSHIP PLACE NOW! a limited number and the interest in quality magic tuition is great. - - EARNING YOU A GREAT REPUTATION AND A LOT OF FUN! It's such a small investment for a lifetime of FUN & FORTUNE! Start Your Magic Lessons Today! SO HURRY! - SECURE YOUR MAGIC LESSONS TODAY! 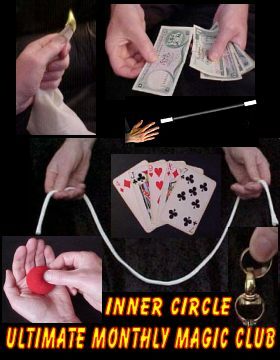 This Unique Magic Club has many hours of Video demonstrations and together with the "easy-to-follow" text and 100's of photographs, it will lead you Step By Step, from an absolute beginner to a competent Magical performer in 24 easy Magic Video Lessons. I will show you the simple basic skills that earned me a great reputation and a very nice income into the bargain. These are the many simple things that magicians take for granted and are never really explained or demonstrated fully anywhere else. Even without the movie clips, the pictures in your course are a lot better than any I have been able to find anywhere else. Many thanks for the prompt delivery of the cd's. I think I may have lost them to my daughter, who saw me reading the introduction and I was told, "thanks dad" ;) and she's only 8. She seems to have developed the magic bug as well. I managed to get the files on my computer and also got the disks back to be really impressed. You'll Be Baffling and Amazing your friends! From Month #1 you'll always have something magical at your fingertips. Month #2 shows how you can Burn and Restore a borrowed handkerchief. You'll be able to produce $$$ Dollar Bills from thin air at will. I call it "Cash In A FLASH"- Just imagine, you're at the bar or in the restaurant, you're about to pay your bill but indicate to everyone that you've got no money. - But wait! - You gently rub your empty palms together and "WOW" - from out of thin air, a $20 bill (£20) AMAZING! You'll unbelievably change blank pieces of paper into $$$ Dollar Bills in a Flash and you'll discover the secrets that'll allow you to have a bit of magical fun any time you handle money. That's a lot of MAGIC! The Course Was Great Value for Money! The Course was Great Value for money; an all-round introduction and increasingly advanced Magic Course, presented by someone who is a real professional and exudes a love of his audience and customers. Thank You : ), - In admiration. As the magic course progresses, I will reveal the very routines that I used in my amazing cabaret act, so that you'll be able to perform a really professional act of your own with ease and confidence. SO HURRY! - SECURE YOUR MAGIC CLUB PLACE TODAY! Please try this Unique Magic Club for the next 60 days and if you are not completely satisfied, - Just Tell Us Why - (we're really interested in your results) and you will receive a Full Refund, with no questions asked! - That's a promise! What's More - You can keep the Magic Lessons you've already received. If you've always wanted to do magic and gain the admiration and respect of everyone, - be the "life and soul" of any party or gathering and be the envy of all your friends, then you'll find these "easy-to-follow" lessons are the answer and you'll also have such tremendous FUN! Go on! Try the Club for TWO MONTHS with absolutely NO RISK! You've nothing to lose - but you'll have to be quick! It's a small investment, only $9.97/month for a lifetime of FUN & FORTUNE! Thanks For a Great Course... Thoroughly Enjoyed It! I've always had an interest in magic and the course appeared to be a great chance to change from hobbyist to perhaps semi-pro. I think the Videos linked to written material works incredibly well. The routine that I’ve performed the most and found so effective is the Cups and balls. It’s just great, I would never have thought of using ordinary cups though? I think the course is Excellent value for money...it will really advance your dexterity as a magician! A Lifetime of Magic and Fun! Right from Lesson #1 You'll discover amazing tricks that you'll use for the rest of your life to Amaze, Amuse & entertain your friends. Just imagine borrowing a pen and a coin, placing the coin in the palm of your hand, then you simply tap the coin with the pen and WOW!! IT'S GONE! - That's AMAZING!! But where's it gone? You don't seem to know, and of course the person you borrowed the coin from is getting worried. At last, you discover that the coin is actually in the small top of the pen although it's 4 or 5 times the size - Now that's IMPOSSIBLE!! Everyone's astonished and then to top it all you simply shake the cap of the pen and out drops the borrowed coin... NOW THAT'S MAGIC!! I call this "Coin Pen-etration". - It's right there in Lesson One and you'll use it for the rest of your life. It's easy to do and always brings a tremendous response from your audience. - You'll Love It!!! I Love It ! - Keep Up the Good Work - Thanks Very Much! Thanks very much for the pennytration trick! I love it! I also do performing at an entertainment centre, and I have been scouring for something quick for little kids. The Penny-tration was it! I also love your "Watch This!" It's really clever and entertains tables really well! There's a huge amount of great tricks, tips and magic hints in each monthly lesson and you can start right now!... You'll be so glad you did! SO HURRY! - SECURE YOUR MAGIC CLUB MEMBERSHIP TODAY! If you're serious about boosting your reputation and your income and making your life more Magical, then you owe it to yourself to get started right away. Click Button Below to Reserve Your Magic Lessons NOW! JOIN US NOW and discover how much Fun and Magical your Life can be! P.S.- Remember, you can start Right Away and get two months Magic Packed lessons at NO RISK whatsoever! Book Your Magic Lessons NOW! But wait! - you agree to polish one of the borrowed rings but Disaster! - it turns to a pile of crumpled gold dust - Oh No!. 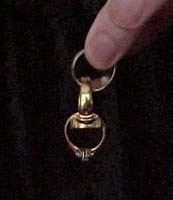 However, with your reputation and your life on the line, in a FLASH you TURN THE GOLD DUST BACK TO THE ORIGINAL BORROWED RING - WOW! Can you believe it? Yes! the secrets of how you can do just that and many, many more magical miracles, make this magic course something you just don't want to miss! Book Your Magic Lessons NOW! - Pay just $97 and SAVE ! I started a few years ago to do some magic with some ready made tricks and then started buying some books filled with illustrations, these books are very good but sometimes very hard to understand even with the illustrations. I couldn’t find a magician who would teach me his secrets until I came across your magic course. Of course you will feel uncertain about such are course, especially in the beginning, you’re expecting a lot of difficult hand moves and sleights. To my amazement this never happened, everything was easy to do. My favourite so far is The Cups and Balls routine,- you fooled me and that close up. I have only seen this once before and that was by a master magician in Las Vegas US. He now trains other magicians how to do this routine for hundreds of dollars per session, yet it’s just a part of one of the Lessons in the course. From the 26 cd’s you send I have performed nearly every trick at one stage on its own or in combination. So It’s definitely boosted my repertoire and confidence in doing magic and continuing to do magic for a long time to come. Thanks for the magical moments you have given to me. P.S., I know you have retired from performing magic, but in case your ever change your mind and you are looking for an assistant, keep me in your mind. So don't miss out - Book Your Magic Course NOW! THE FINAL LESSONS REVEAL - Several Cabaret Items and the Amazing - "David Blaine's Mega Magic"